Saving more than 3,000 lives: Only the United States can do it. More than 3,000 innocent civilians, to whom the United States solemnly pledged protection, are now at risk of being killed by Iranian agents, following the withdrawal of US military personnel from Iraq. It's a potentially tragic situation whose ending is far from certain. Moreover, the cascading violence in Iraq has turned this situation into an emergency. These civilians are Iranian dissidents, many of whose family members and colleagues were murdered by the Iranian government. They belong to an organization called MEK, which the United States-for entirely political reasons-designated a terrorist organization, despite the fact that there is no evidence that any of its members have engaged in acts of violence for years. The United States Court of Appeals has ordered the State Department to reconsider its designation based on current evidence, but the State Department has been dragging its feet, thus providing the Iraqis-who are increasingly doing the bidding of Iran-an excuse for targeting MEK members. Iraqi Prime Minister Maliki always refers to MEK as a "terrorist" group, while threatening their security. But these civilians agreed to disarm and consolidate in a safe location called Camp Ashraf, in exchange for an American promise of protection. Despite that promise, dozens of them have been murdered by Iraqis acting at the behest of the Iranian government. Now that the United States has ended its military presence, Iraq is moving much closer to the mullahs of Iran and is more anxious to do their bidding. The mullahs want these people dead, because many of them are witnesses to horrendous war crimes committed by the Iranian government against dissidents and other civilians. The Iraqi government has announced that it will close Camp Ashraf and move its residents to a much smaller facility euphemistically named Camp Liberty. The eventual goal is for these residents to be able to move to other countries where they can be safe from Iranian vengeance. Everyone acknowledges that as long as they remain in Iraq, particularly today's Iraq, they are not safe. Both the Jewish Talmud and the Muslim Koran state that "he who saves even a single human life, it is as if they have saved the entire world." The US has the opportunity to save more than 3,000 human lives, but it must use its considerable influence to pressure the Iraqi government to protect the residents and to facilitate their speedy transfer to safe locations outside of Iraq. As human rights advocates, we generally get to become involved only after tragedies have occurred to bring people to justice. However, we now have an opportunity to prevent a terrible injustice before it can be carried out. There's good news and there's bad news. I've been involved in human rights advocacy for half a century and I have never seen a more effective example of preventive human rights advocacy than what we have seen shaping up over the past year regarding Camp Ashraf. Our efforts have now reached the highest level in the State Department and the White House. Mrs. Maryam Rajavi, the president-elect of the National Council of Resistance of Iran, deserves much credit for demonstrating that human rights advocacy can help prevent humanitarian disasters. I see this project as a model of how human rights advocacy can save lives. But the bad news is the new reality in Iraq as reflected by recent headlines such as, "Iraqi Prime Minister Welcomes Group with Close Ties to Iran and a Violent Record." We simply cannot trust the current Iraqi government to protect the people at Camp Ashraf. How easy it would be for the Iranians, with the complicity of the Iraqi government, to organize a horrible massacre and deny that their fingerprints are on it, just as both governments disclaimed responsibility for the previous massacres of Ashraf residents. We must get the MEK removed from the State Department's terrorist list immediately. The MEK does not belong on that list, as a matter of law, as a matter of fact, and as a matter of morality. And we must get the residents of Camp Ashraf removed from Iraq as quickly as possible, in order to prevent a humanitarian disaster. I am heartened that Eli Wiesel is deeply concerned about the situation in Camp Ashraf and the unjust label and treatment of the MEK members. He is heavily committed to this life saving activity. And he reminded me of something he said many times, that a major lesson of the Holocaust for him was always "believe the threats of your enemies more than the promises of your friends." Let's be very clear, when it comes to the residents of Camp Ashraf, the responsibility stops with the United States government, which made the promise to protect them. Now is the time to turn promises into life saving actions. Iraq says that it wants to transfer the thousands of the residents of Camp Ashraf from the very decent homes they built, to another small and dilapidated place at Camp Liberty in Baghdad, which could very well turn into a prison for the residents. It has threatened violence and arrests if there is any reluctance to move. Human rights lawyers and monitors must be allowed to go to Iraq and actually observe and monitor the transfer to make sure that it's done right and that the residents are not taken by the Iraqis into a prison or turned over to the Iranians, using the credibility of the United States and the United Nations as a cover. And we need to find countries around the world that are prepared to take these people until such time as they can safely return to their homes as free citizens. The best current action would be for the United States immediately to airlift the endangered civilians out of Iraq to a safe country which would agree to house them temporarily until they can find a more enduring asylum. We have the great honor and privilege to be in a position to save human lives. We must not shirk that responsibility. Professor Alan M. Dershowitz is Brooklyn native who has been called "the nation's most peripatetic civil liberties lawyer" and one of its "most distinguished defenders of individual rights." He is the Felix Frankfurter Professor of Law at Harvard Law School. 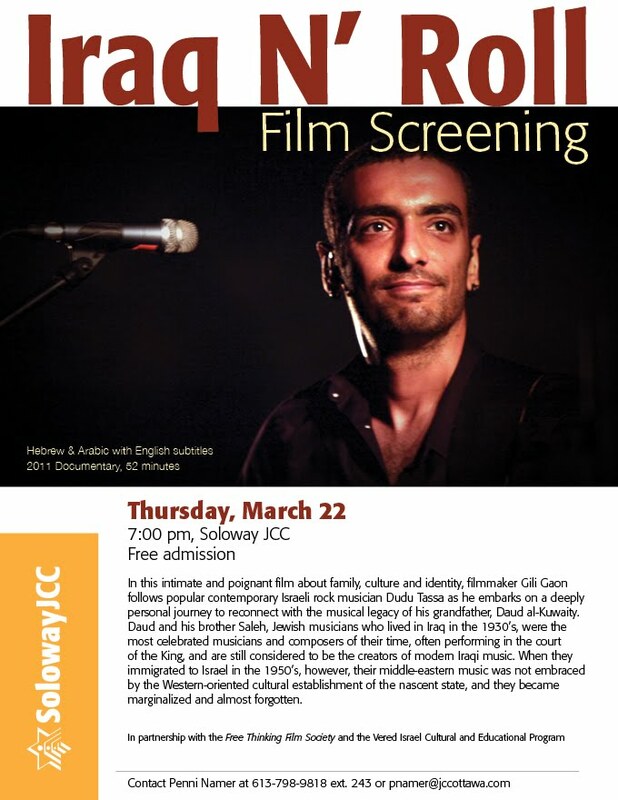 Don't miss this terrific film in Ottawa On March 22nd at the Soloway Jewish Community Centre. Admission is free! A friend of mine took this picture put up by a student club at the University of Ottawa. Look Ma, No Israel! All hell will break loose at the University of Western Ontario if the students who disrupted an Israel On Campus (IOC) event don’t face repercussions, warned a frustrated IOC member. Aubrey Chapnick, a third year student in the Business Management & Organizational Studies program at UWO, told the Jewish Tribune he was enjoying the non-political Israel Day displays last Wednesday when a large group of anti-Israel activists showed up en masse, without permission, and were allowed by campus police to block access to the event for about an hour. Many of the protesters had duct tape over their mouths and carried signs with anti-Israel messages. It’s too early to say if the protesters will face any sanctions, according to Elgin Austen, director of campus police at UWO. Jeremy Chad, a third-year business and engineering student at UWO and IOC member, told the Tribune that the protest appeared to have been planned. Shortly before 1:30 p.m., members of the student newspaper arrived and were seen watching from the balcony, and others who looked like media showed up around the same time, said Chad. At about 1:30, a group of about 60 people, “came from the downstairs area and stood in between the Israel Day booths and the entrance to the building.” The protesters created a physical barrier that prevented anyone from seeing or visiting the Israel Day festivities. 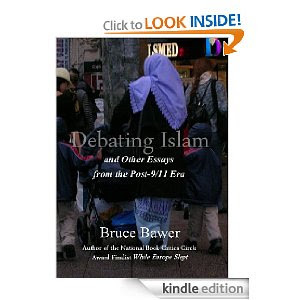 Here's another must-download book from Bruce Bawer, and at $2.99, it's a no-brainer. Download it now. In his bestselling 2006 book "While Europe Slept", Bruce Bawer sounded the alarm about the rise of radical Islam in Europe. In Debating Islam, Bawer brings us up to date, showing how Islamism has continued to advance in Europe – and revealing that America, too, contrary to his earlier expectations, is proving vulnerable to its depredations. Among the topics he takes on are the prosecution of Dutch politician Geert Wilders for speaking his mind about Islam, the refusal of the media to face the obvious facts about the Fort Hood massacre, the controversies over Koran burnings and the Ground Zero mosque, and the ominous rise in European anti-Semitism. This book is a must-read for everyone who is concerned about the threat posed by Islamist ideology to the freedoms of the West.